Searching for your lost shaker of salt? You might find it again in Orlando this winter. According to Coastal Living, Jimmy Buffett fans will have a brand new destination to go to on vacation in January 2019. 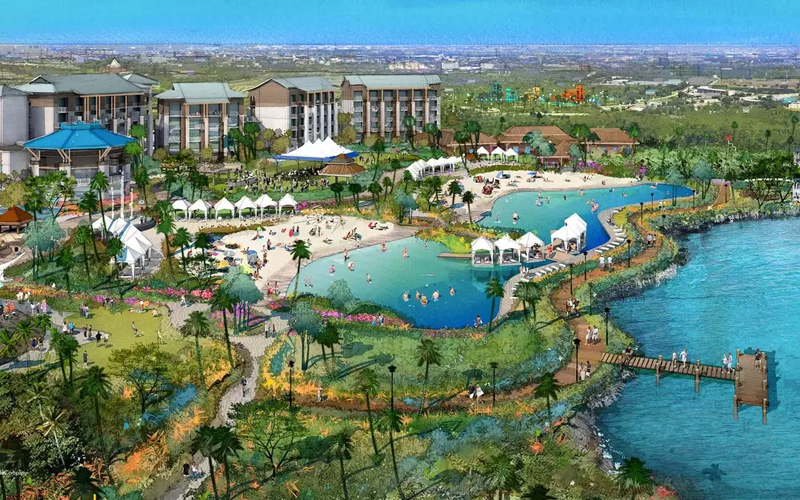 Margaritaville Resort Orlando, a 300-acre resort that’s like an all-inclusive, one-stop destination to “waste away” in. The resort will consist of four sections, Margaritaville Hotel (with rooms starting from $199 per night), Margaritaville Cottages (which you can rent or own, if you’re a true fan), the Sunset Walk shopping, dining and entertainment district and a huge, 14-acre water park. The water park itself, Island H20 Live!, is a reason to visit all on its own. According to People, the park is featured as Florida’s “most immersive water park,” in a resort press release. Park visitors will be able to waft on a lazy river, toss themselves around in a wave pool and enjoy nine different thrill rides, as well as take their families along to play in the kid’s area and embark on a raft adventure. Or, if you’re more into relaxation, there are plenty of cabanas and hammocks to chill in the summer sun. “Margaritaville Resort Orlando will be the first resort destination in this area where guests and owners can equally enjoy a personalized, premium experience and a robust offering of amenities, all within easy walking distance from their guest room or cottage home,” said Alyssa Bushey, head of marketing for the resort, in a news release, according to Coastal Living. Bushey also mentioned that guests can enjoy more than 35 restaurants, shops, spas, and entertainment spots, including lagoon-style pools and a dine-in movie theater. The water park is planned to open in the Spring of 2019. And it’s not just adults who will be able to enjoy paradise. The resort will also have teen and kids clubs for younger Buffett fans as well. More information on booking a room or planning a visit can be found on the Margaritaville Orlando Resort website.